Sometimes authors step out of their comfort zones more than once...with the same book. On August 9, 2012, Kris Kennedy stopped by to talk about her (then) new book, Deception. It was a departure from the norm for her, as you will read in the post below. It was a good book that pushed her boundaries but Kennedy thought it could be better, something she revealed to readers years later after starting over and re-writing the book that had already been published. That takes guts, but that's the kind of author Kris Kennedy is. In 2017, a new version of Deception was published. It was well worth the wait. It's such a pleasure to host Kris Kennedy today! She's one of my auto-buy authors and an absolute delight. I met Kris at RWA National in New York City in what was a true fan girl moment. I was volunteering at the registration desk when this bubbly, curly haired woman bounced in, took the volunteer seat next to mine and said, "Hi! I'm Kris!" I glanced at her badge, noted her full name and thought, "OMG! It's Kris Kennedy! I love her books!" I'm not sure exactly what came out of my mouth. I sincerely hope it was at least semi-intelligent. lol! 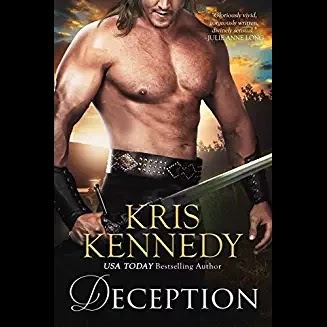 If you're a fan of medieval romance (like I am) and you haven't read a Kris Kennedy book yet, now's a great time to give them a try. Her newest is a little different from her others (though no less terrific), as Kris explains below. Please give her a warm welcome to TRD! My latest story, DECEPTION (link: http://kriskennedy.net/), was just released on the world last week, and I’m so excited! I’m also a bit terrified. Without meaning to (but sort-of, kind of meaning to) this story pushed creative boundaries for me, and did so within some tight timelines. But it’s also different from the other stories. It’s not your typical medieval romance, with knights and sword fights and chases across the countryside. It’s more about con jobs. And dirty money. And the powerful men who want it, and what they'll do to get it. And of course, the person who will risk everything to stop them. Irishman Kier is a con man with a history of staggering successes and one truly awful failure. Now he's on a mission of revenge, and the men who betrayed him are about to pay. He’s set up an elaborate long con against some of the most powerful men in England. He’s planned everything: the bait to lure his targets out, the methods by which he’ll reel them in. He’s a professional schemer in every cell in his body, and thus, he’s planned for everything. Except the appearance of the woman who can bring the whole thing crashing down around him. Sophia is a woman who’s been pushed a little too far, a little too often, and now she’s pushing back. She intends to stop the powerful men who’ve shadowed her life. To do that, she needs proof of their evil deeds, which lie in the Darnly ledger. The ledger documents the corruptions of some of the most powerful men in England, and it has the potential for extortion on a grand scale. In the king’s hands, it can ruin them. Sophia intends to make sure that’s exactly what happens. Simple enough. Until, sneaking in to steal the ledger, she meets up with Kier. He wants the same thing she does, the Darnly ledger. She has no intention of giving it to him. He has no intention of letting her go until she does. And neither is backing down. It doesn’t help that they were once in love. From the moment of their unexpected, explosive reunion, Sophia knows that Kier—her ex-lover, her outlaw lover, the man who stole her heart then threw it off a cliff five years ago—is up to no good. But when all her other options have been removed, when the only thing left to do is to walk away and accept defeat, Sophia plunges headlong into Kier’s dangerous schemes, determined to bring down the corrupt men who’ve ruined her life. One of whom, she’s quite sure, is Kier. This whole set-up, from plot to characters, was so different from my other three. First of all, it was a reunion story, and I’ve never done one of those before. It was fun, and different. Additionally, there were no knights (except a false one) and no chases across the countryside (although the story takes place during a very hot summer, and thus there are thunderstorms and, subsequently, wet tunics draped over a muscular body, and at one point, there is ice involved). And it’s not always clear which is the (metaphorical) dragon to be slain. Usually, my stories are almost Errol Flynn-like adventures. I love that sort of drama; it’s a blast to write, and has built-in tension. But this one was different. I had to build tension differently. A reunion is different from a first-meet. Fleeing from danger is different from setting a trap. Hiding from the bad guys is not the same as putting yourself directly in their line of sight. Riding across the countryside is different from dressing for a gala affair. Pursuing a bad guy is fundamentally different from luring him in. Instead of chases and armor and clarity about who the bad guy is, there’s planning and targeting and confounding people. There’s dressing in rich clothes to fool people and feigning distress when they discover the very thing you meant for them to see. There are men to trick and men to fight, there are offices to be broken into and rumors to start. There are tall ships with green sails and long, hot summer nights between two people who have dreamt of each other for five long years. Hmmm...I guess that DECEPTION is not so different from the others, for all that the plot pushed me out of my comfort zone. In the end, it’s still one of mine. Strong passions, strong men and women, a dragon to slay, and people risking everything for all the right reasons: the person they love. And I hope you love it! Do you enjoy Medieval romance? Do you have favorite authors writing in that era that you would recommend? First he loved her. Then he abandoned her. Now he's the only one who can save her. Irish warrior Kier is on a mission of revenge. Can he bring down the most powerful men in England? Or will Sophia be his downfall...again? Five years ago they had a reckless affair. Kier fell hard for the daughter of a judge who woke something inside him he thought had died: love. But he had to make a choice. He chose to abandon her. It was the only way. Now he's back, and he needs what she has: a document that holds the key to enact his vengeance. Sophia is furious by the reappearance of the outlaw lover who abandoned her years ago. But she's on the run from dangerous men, and decides to do the riskiest thing of all: turn to Kier to save her. Now their lives are entangled a second time, and they're both in danger. He needs to focus. She needs to escape. And their enemies are onto them. Will they escape? Will their passion save them...or destroy them? And when offered the chance to do it all again, which will Kier choose this time: his mission or the only woman he's ever loved? I have enjoyed medievals by Johanna Lindsey and Judith McNaught, but my favorite medieval author is Julie Garwood. So many of her books are on my keeper shelf, and oh how I wish she would go back to writing those. Right there with you on the Garwood wish! Jude Deveraux, Monica McCarty and Maya Banks all have good medieval series. Julie Garwood is a good one too! I have not read medieval romance in some years, not because I don't enjoy them. Several of my favorites remain those written by Julie Garwood and I also have a well-worn copy of This Is All I Ask by Lynn Kurland. They are comfort reads. I love medieval romance but it's so hard to find good ones not steeped in religion. I have to be honest and admit that when religion is prominent I just can't get into the story... I really have to catch up on Ms Kennedy! Julie Garwood, Amy Jarecki and Kathryn LeVeque. Judith McNaught and Julie Garwood are probably the only two Authors who held my interest with Medical romance stories.